CSUN alumnus Michael Grillo speaks at the David Nazarian College of Business and Economics' Distinguished Speaker Series at CSUN on Sept. 26. Photo by D.J. Hawkins. Grillo speaks to CSUN students, faculty and staff after the event. Wendy Greuel, Nazarian College Executive in Residence and Strategic Advisor, emcees the event. Greuel and Grillo worked together at DreamWorks. Spielberg and Clooney, Kidman and Downey Jr., Geffen and Katzenberg, Marvel and DreamWorks. California State University, Northridge alumnus and filmmaking heavyweight Michael Grillo shared memories from his decades working with Hollywood royalty in front of a packed auditorium at CSUN’s Northridge Room. 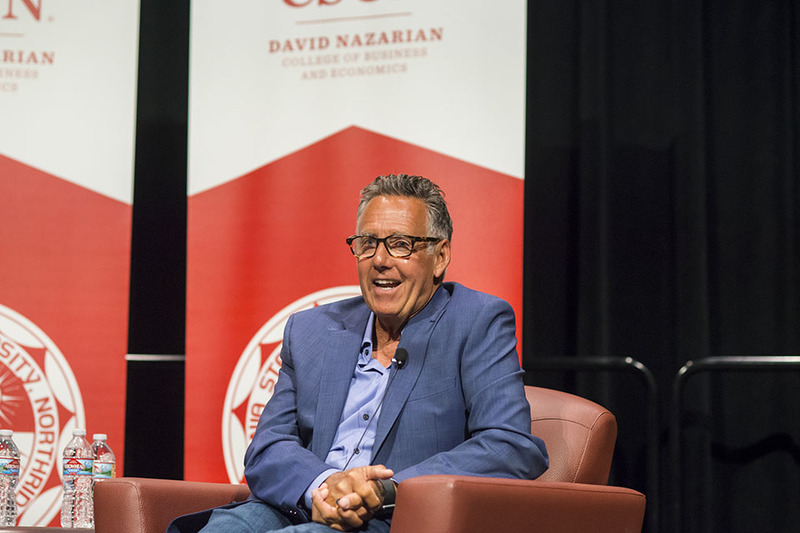 Grillo appeared on campus Sept. 26 for the David Nazarian College of Business and Economics’ Distinguished Speaker Series. Beneath the glossy surface of silver screen memories was a deep message that Grillo ’71 (Business Administration) imparted to Matadors. First, Grillo said, he still pinches himself every day — even after 50 years of making movies, including one of the biggest box office hits of all time. Grillo was the executive producer of Marvel’s Avengers: Infinity War. According to IMDb, the film’s budget was more than $300 million, and it grossed more than $2 billion, the fourth-highest grossing film worldwide ever. Grillo is also the executive producer of the forthcoming, untitled Avengers movie, scheduled for release in 2019. Second, there is a place for anyone who wants to get into the industry, he said. The theme of Grillo’s 90-minute talk to students, faculty and staff was the intersection of filmmaking and business. As executive producer of two of the biggest blockbusters in history, it was the 70-year-old’s job to ensure each film was made on time, on budget, and all the pieces were in place for a team of hundreds to execute a constantly shifting plan. Grillo said his job impacts both business and creative sides of filmmaking, and it touches all points of a movie, from planning to production to marketing. For example, a marketing team will show up during filming and ask that a particular scene gets shot earlier in the production, so they can use that scene earlier to promote the movie. “It’s not two separate entities,” Grillo said. “Making movies is a business, and all the creative decisions have a financial basis. So, what’s really interesting is having very creative people working with people who are business oriented. Putting the whole group together to make something that you think is really special, that people will respond to and also makes money. Grillo said he doesn’t allow the pressure of it all to get to him. 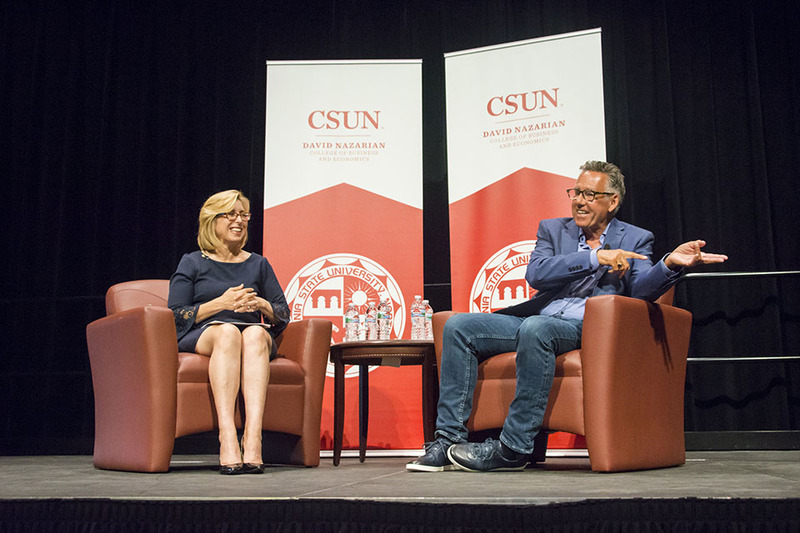 Grillo shared parts of his journey at CSUN, where he earned his bachelor’s degree during the late 1960s and early ’70s, one of the most turbulent times in U.S. history, and he said that going to college was a haven for young people like him who had no interest in going to war in Vietnam. After CSUN, Grillo went to the Directors Guild Training Program, which helped launch his career in entertainment that has included his work on some of the best-known American films of the past 50 years —The Deer Hunter, The Big Chill, The Accidental Tourist (a movie nominated for a Best Picture Oscar in 1989), Saving Private Ryan, American Beauty and Gladiator. At DreamWorks, he was the studio’s first head of feature film production and oversaw production on all of its live-action movies from 1996 to 2006. Grillo spoke about his ties to his alma mater, which was then called San Fernando Valley State College. 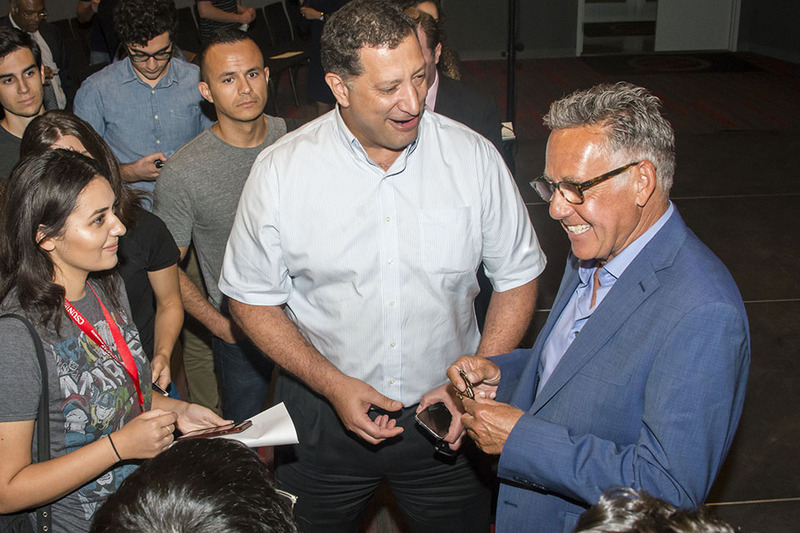 “The process of being challenged to do things and try and figure out how to solve them and be successful at the end of the day” was one of his biggest takeaways from CSUN, he said. Grillo said he was gone from his Hermosa Beach home for two and a half years while making Avengers: Infinity War and the yet-to-be-released fourth Avengers movie. He said he’s unsure as to what the future holds and joked that maybe he’ll just hang out on the beach and enjoy life. For the moment, he said, he’s enjoying life. And on this night, he enjoyed giving back to CSUN.